Around 60 Holy See employees have joined the Vatican’s athletics team. 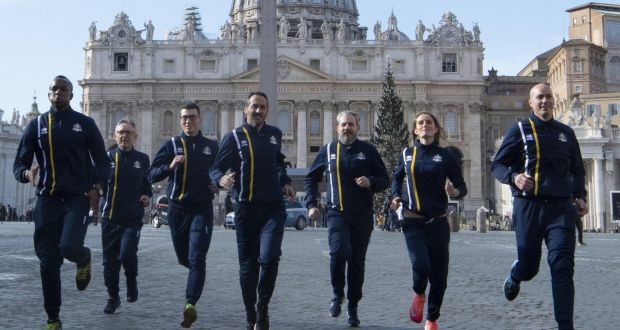 The official team consists of about 60 Holy See runners : Swiss Guards, priests, nuns, pharmacists and a 62-year-old professor from the Vatican’s Apostolic Library and immigrants and refugees. This is to promote sport for dialogue, peace and solidarity. The team are now a part of the Italian track association and are trying to join the International Association of Athletics Federations. It is hoping to compete in international competitions, including the Games of the Small States of Europe. The Vatican hopes to sign with the Italian Paralympic committee. “The dream that we have often had is to see the Holy See flag among the delegations at the opening of the Olympic Games,” said Monsignor Melchor Jose Sánchez de Toca y Alameda, the team president and the head of the Vatican’s sports department. He said that the Vatican was looking to participate in competitions that had cultural or symbolic value. “We might even podium,” he added. “promote culture and running and launch the message of solidarity and the fight against racism and violence of all types”. The Vatican has had unofficial football teams and a cricket team that participated with the Anglican church through annual tours in Britain. The track team are the first to have a legal status in Vatican City and to have Italian national coaching, scientific and medical resources. Vatican Athletics’ first official event is the La Corsa di Miguel on 20 January, a 10km race in Rome honouring Miguel Sánchez, an Argentine distance runner who was one of the thousands of young people who “disappeared” during the country’s War.